Q: My child has played four years of cross-ice mite hockey; should she play on a 10U team this season even though she is only 8 years old? A: The short answer is, “No. She shouldn’t play on a 10U team this season,” but let’s take a deeper dive into the topic. In the academic world, kids generally advance through the ranks with their age group or perhaps with a slightly younger group. It isn’t unheard of for a parent to start their child a year late in kindergarten or repeat second or third grade if the child is a little bit behind their chronological milestones. However, in the athletic world, we see many parents and coaches encourage the opposite approach, i.e., making kids play with an older age group, even though doing so is usually a bad idea, which is why it almost never happens in the academic world. If a kid hasn’t mastered simple addition and subtraction skills, would we introduce multiplication and division problems? Not if we’re interested in their long-term development and success. Unfortunately, I have seen way too many 8U “addition and subtraction” players rostered on 10U “multiplication and division” teams. Most of the time, it happens because an adult thinks this is the best situation for the child’s development, when in fact, it can be detrimental to their short-term and long-term success within the sport. Last winter, a cutting-edge NHL analytics team put the test to youth hockey for the first time ever, comparing cross-ice hockey to full-ice hockey. Every player benefited statistically from cross-ice hockey, but the gains were even greater for advanced players. Their puck touches doubled. Their shot attempts doubled. Their pass attempts doubled. Their skating changes of directions doubled. Their pass receptions quadrupled. They had to make decisions quicker. Cross-ice gave them more of what’s good for development (and for confidence and engagement). This doesn’t sound like a situation that players should leave prematurely. USA Hockey uses lightweight blue pucks at the 8U level in order to allow these younger players to develop proper technique in passing, shooting and stickhandling. The blue puck is ideal for younger players to improve their coordination, quickness and speed. The idea of using a heavier puck at 8U to strengthen players should not be a focus of development, as children do not reach their strength-building window of trainability until after puberty. At younger ages, teaching proper technique in passing, stickhandling and shooting through the use of age-appropriate equipment is critical to skill development. And this kind of teaching should be paramount at 8U, a stage when the fundamentals should be introduced and refined. Lighter weight blue pucks, along with the correct stick, help players build confidence and avoid frustration by being able to lift the puck, score goals, complete firm tape-to-tape passes, etc. Again, this doesn’t sound like a situation that players should leave prematurely. Additionally, these are 8-year-olds we’re talking about. Very young children, especially in a late-specialization sport like hockey. There should be no rushing their development. It’s detrimental and it’s unnecessary. I find that there are a number of reasons why parents think their kids should “play up,” but those reasons usually aren’t rooted in a focus on skill development and long-term success. For example, being big for their age is not a good enough reason to play up. Deeming them “special” or “talented” at 8U is misleading, since hockey is a late-specialization sport. It’s not a good reason to play up. Someone’s ability level at 8U is not indicative of where they will be compared to their peers eight years later. The reality is that it’s beneficial to allow players to be the older, stronger and more skilled player on a team. There is nothing wrong with a player dominating at the 8U level. It will help them gain confidence. It will help them refine basic and advanced skills. And they’re not missing out on anything. As they age-up to 10U hockey and beyond, they will continue to have this opportunity every other season. Again, there’s plenty of time. There’s no need to rush. Another rationale I sometimes hear for “playing up” is that parents want to move their kids to a “better” team instead of letting their child play for a “lesser” team. But the reality is, they may develop more on the supposed lesser team. Enhanced leadership opportunities, playing key roles, learning to make their linemates and teammates better – these are all byproducts of playing a larger role on a “lesser” team as opposed to playing a lesser role on a “better” team. So while it may be enticing to move a player to an older team for a stiffer challenge, keep in mind that putting players in situations where they are physically, mentally or socially overwhelmed is counterproductive and dangerous. An 8-year-old might be an early developer for an 8-year-old, but may struggle to keep up or dominate at 10U. That’s not best for their long-term development or their short-term fun. Lastly, raiding 8U teams to field a 10U team because of registration issues is not a good reason to move players up. We see this scenario most often in female hockey. Taking a developmental opportunity away from one group of players in order to help temporarily solve a 10U numbers issue isn’t a fair and appropriate solution. Development must come first in order to create an age-appropriate and safe environment. If there aren’t enough female players to field 10U teams, encourage the families to recruit 3-5 boys to play on a co-ed team. The physical differences between boys and girls under age 12 are minor; if anything, the girls are biologically maturing at a faster rate at these young ages. Development takes time and patience. We shouldn’t fast-track our young athletes’ playing careers. Rather, we should nurture their age-appropriate development, creating a higher ceiling of skill and ability. Let kids be kids. Adulthood will be here soon enough. Remember, reaching full potential in hockey – and mathematics – is a marathon, not a sprint. The author, Michele Amidon, was a four-year letter-winner at St. Lawrence University and an ECAC MVP. 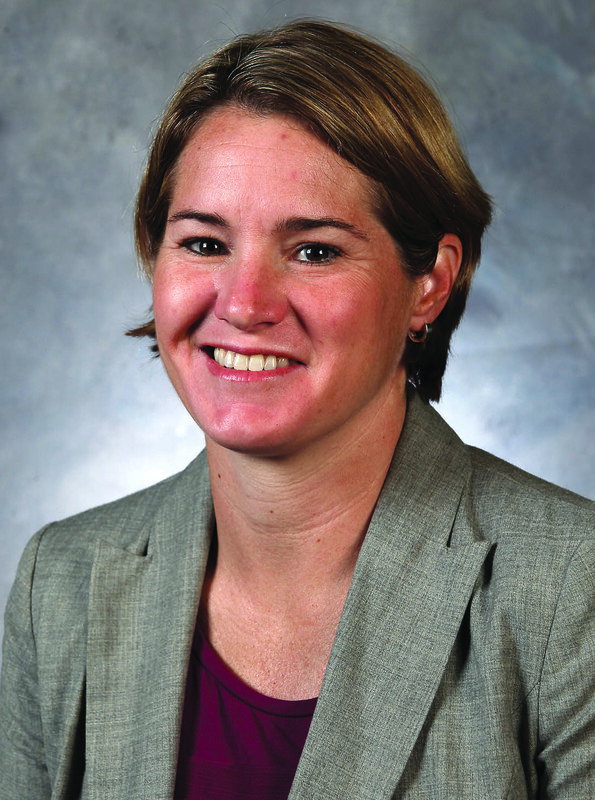 Later, as a coach, she guided Bowdoin to a pair of national tournaments en route to being named NCAA Division III Women’s Hockey Coach of the Year.